Wow! It’s been a hectic couple of weeks here at Beastie Towers! Sometimes a project comes along that demands a little extra effort, and that’s why there hasn’t been much activity here on the BeastieBlog lately. I’ll unveil that monster undertaking soon enough, but it seemed a bit much for a Friday… so let’s take a leisurely stroll around Dublin with Tae Beastie instead! Just over a month ago, I got a request through Etsy for a Beastie with a mug. My tea-loving Barróg Beastie, Tae Beastie, was excited to leave Beastie Towers for pastures new… and when his family-to-be asked for some photos of him in his home town, we were happy to oblige! 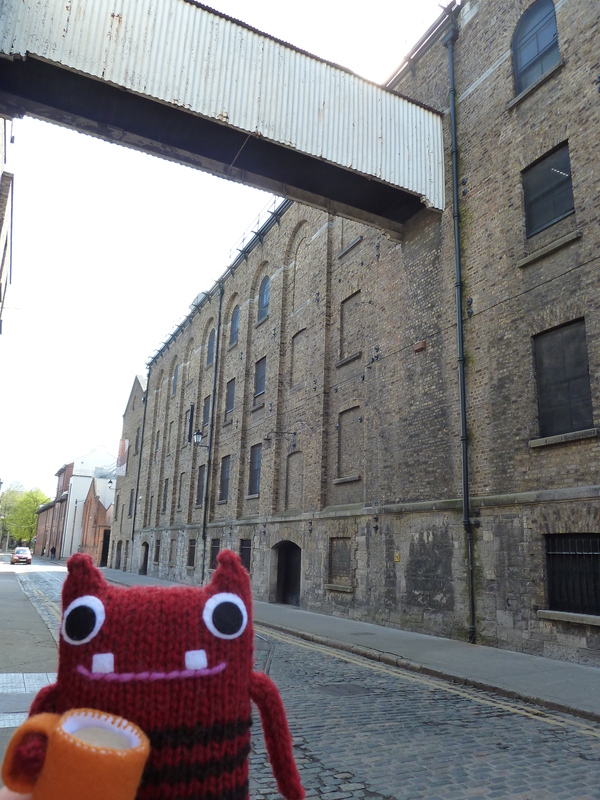 So here is Tae Beastie’s whistle-stop tour of Dublin, in pictures! We started off just down the road from Beastie Towers, at the Guinness factory. Guinness is still brewed here on the original site at St James’ Gate, a little west of the city centre, and most days the air in this part of town is filled with the delicious chocolately scent of roasted barley, which gives the beer its dark colour. As you can see, there’s quite a contrast between the modern high-tech brewery and the older buildings on the site! However, many of the original buildings are still in use – one houses the Storehouse visitor centre, while others have been converted into offices. After a wander through the lanes and alleys of the old brewery, we started heading for town! There was plenty to see along the way – this part of the city is packed with old churches. I asked Tae Baestie to pose with two of the most well-known… first of all St Audoen’s Church, which was built in 1190 and is the oldest parish church in Dublin (factoids courtesy of Wikipedia). I’ve also heard rumours that it’s haunted! Next, we passed Christ Church Cathedral, which in Medieval times was right in the very heart of the city. It’s a fascinating building, with flying buttresses, a crypt and a covered passageway which links the Cathedral to the Synod Hall on the other side of the street. Christ Church stands at the far end of the Temple Bar area, so our next move was to take a stroll through the cobbled back streets! 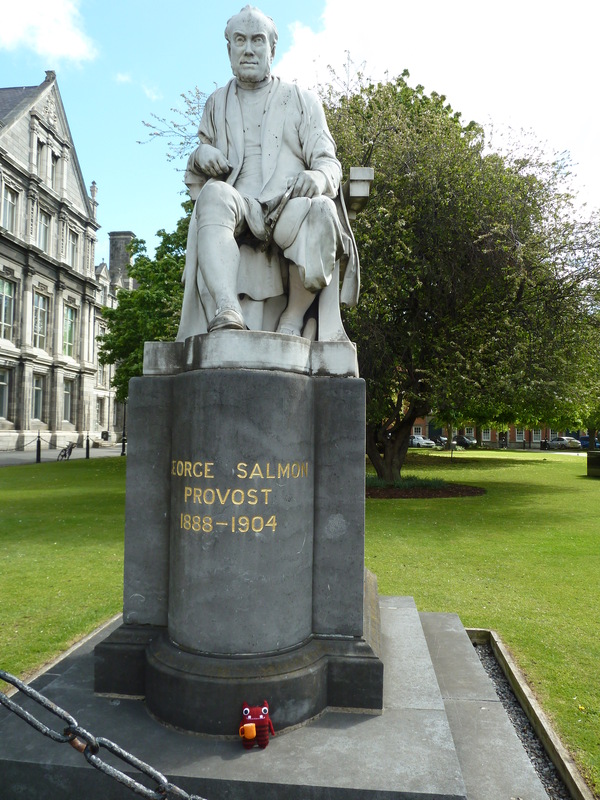 Our walk through Temple Bar brought us out conveniently just in front of Trinity College, home of the Book of Kells. It’s also where I went to university! This is Front Square, and the archway you can see towards the back of the picture is the main entrance to the College. Outside is one of the busiest roads in the city centre… but once you walk through Front Arch, all the traffic noise just VANISHES. It’s like stepping back in time! Tae Beastie enjoyed posing with the Campanile and this statue of a former Provost, whose expression I just can’t figure out… is he very stern, or does he have a bit of a cheeky glint in his eye? 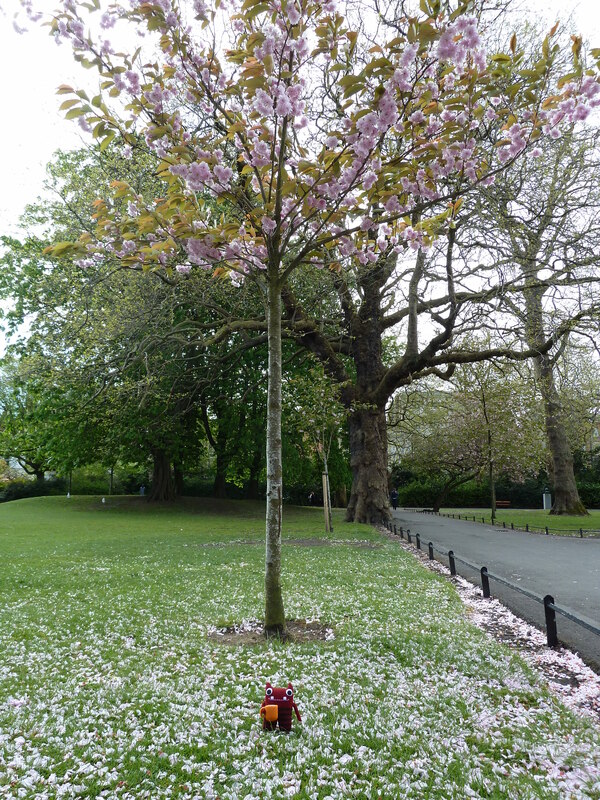 After that, we made a beeline (or, rather, a Beastieline) for St Stephen’s Green. This park is right in the middle of the south side city centre, and it’s a great place to enjoy the arrival of spring! Just inside the main entrance at the top of Grafton Street, you’ll find this lovely long avenue of lime trees. I’ll sometimes go out of my way to walk along here, whether it’s to enjoy the shade on a hot summer’s day, or kick through piles of bright yellow heart-shaped leaves in the autumn. Tae Beastie was especially taken with the fresh new foliage… check out those vibrant bright green leaves! We managed to get our final pictures just as the sun disappeared behind a cloud, and (luckily) before the rain started. Well, that’s spring in Ireland for you! Later that day, Tae Beastie headed off to his new home in Atlanta, Georgia… let’s hope he’s settling in well in the Peach State! I have to admit to enjoying a pint or two of the black stuff every now and again myself… it’s hard to resist the temptation when you can see the brewery from your house! And if you like Guinness, get your Big Man to keep an eye out for Galway Bay Brewing’s Buried at Sea – it’s a chocolate milk stout, and it’s DELICIOUS! Yum! Mmmmmm….. This sounds good!! I have that strange feeling that my BM and me should have fun if travel to Dublin… We have seriously take that into consideration…. Thanks! Hopefully seeing Dublin again has brought back some happy memories of your time here 🙂 And Beasties make pretty super tour guides… They’re small enough to get into the interesting little places that most people don’t see! I hope he enjoys the sun shine, I wonder if he will visit the home of coca-cola? Another fantastic beastie. Great memories to take to his new home! Yes indeed! It was a pleasant morning out for both of us… A relaxed stroll through the picturesque parts of the city makes a nice change from my usual panicked sprint to work!